Lines and are parallel. Which angle is congruent to angle ? 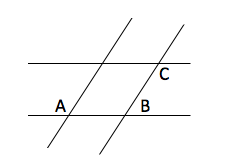 When two lines are parallel, corresponding angles are congruent. Because we don't know if lines and are parallel, we can't make any conclusions about angles 2 and 3. With the given information, we can ignore line , as it has no relation to angle . This leaves angles 1 and 4 as possible answers. Angle 4 will be congruent to angle , while angle 1 will supplement angle . Lines AB and CD are parallel, so that means that d and e, which are in alternate interior angles, must be equal. Because a and d are vertical angles, and because e and h are vertical angles, this means that a = d and e = h. Therefore, a = d = e = h. Similarly, b = c = f = g.
Let us look at the choice f = b. We can see that this is true because b, c, f, and g are all equal. We can then look at f + d = a + g. Let us subtract g from both sides, and then let us subtract d from both sides. This would give us the following equation. Because f and g are equal, f – g = 0. Also, because a and d are the same, a – d = 0. Therefore, f – g = a – d = 0, so this is always true. 180 – (a + c) = e + g – 180.
a and c are supplementary, so a + c = 180. Likewise, e + g = 180. We can substitute 180 in for a + c and for e + g.
This means that 180 – a – c = e + g – 180 is indeed always true. Because a = e = d = h, we could replace all of the values with a.
a – a = a – a = 0, so this is always true. The final choice is b – h = e – c. Let us substitute c in for b and h in for e.
Let us add c and h to both sides. This means that c must equal h for this to be true. However, c does not always have to equal h. We know that c must equal f, and we know that f + h must equal 180. This means that c + h must equal 180. But this doesn't necessarily mean that c must equal h. In fact, this will only be true if c and h are both 90. Therefore, b – h = e – c isn't always true. The answer is b – h = e – c.
In the figure above, APB forms a straight line. If the measure of angle APC is eighty-one degrees larger than the measure of angle DPB, and the measures of angles CPD and DPB are equal, then what is the measure, in degrees, of angle CPB? Let x equal the measure of angle DPB. Because the measure of angle APC is eighty-one degrees larger than the measure of DPB, we can represent this angle's measure as x + 81. Also, because the measure of angle CPD is equal to the measure of angle DPB, we can represent the measure of CPD as x.
Simplify by collecting the x terms. Subtract 81 from both sides. This means that the measures of angles DPB and CPD are both equal to 33 degrees. The original question asks us to find the measure of angle CPB, which is equal to the sum of the measures of angles DPB and CPD. measure of CPB = 33 + 33 = 66. One-half of the measure of the supplement of angle ABC is equal to the twice the measure of angle ABC. What is the measure, in degrees, of the complement of angle ABC? Let x equal the measure of angle ABC, let y equal the measure of the supplement of angle ABC, and let z equal the measure of the complement of angle ABC. Because x and y are supplements, the sum of their measures must equal 180. In other words, x + y = 180. Because x + y = 180, we can solve for y in terms of x by subtracting x from both sides. In other words, y = 180 – x. Next, we can substitute this value into the equation (1/2)y = 2x and then solve for x. Multiply both sides by 2 to get rid of the fraction. (180 – x) = 4x. Add x to both sides. x + z = 90. Now, we can substitute 36 as the value of x and then solve for z. 36 + z = 90. Subtract 36 from both sides. In the diagram, AB || CD. What is the value of a+b? 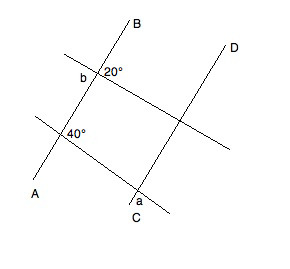 We know that angle b has to be equal to its vertical angle (the angle directly "across" the intersection). Therefore, it is 20°. Furthermore, given the properties of parallel lines, we know that the supplementary angle to a must be 40°. Based on the rule for supplements, we know that a + 40° = 180°. Solving for a, we get a = 140°. In rectangle ABCD, both diagonals are drawn and intersect at point E.
Let the measure of angle AEB equal x degrees. Let the measure of angle BEC equal y degrees. Let the measure of angle CED equal z degrees. Find the measure of angle AED in terms of x, y, and/or z.
Intersecting lines create two pairs of vertical angles which are congruent. Therefore, we can deduce that y = measure of angle AED. Furthermore, intersecting lines create adjacent angles that are supplementary (sum to 180 degrees). Therefore, we can deduce that x + y + z + (measure of angle AED) = 360. Give another name for . Since the angle is called , it has vertex - the middle letter is always the vertex - and it is the union of rays and . Another name for is , since is also on that ray, so the angle can be said to be the union of and ; this makes a valid name for the angle. and are not valid, since the middle letter is not vertex . is not valid, since and are on the same side of the angle. 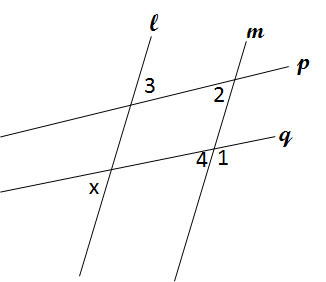 is not valid; an angle can be named using only its vertex only if it is the only angle in the diagram with that vertex, and that is not the case here. Lines and are parallel. 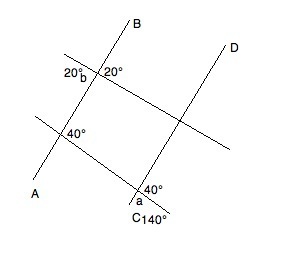 Which of the following pairs of angles are supplementary? Coresponding angles can be found when a line crosses two parallel lines. 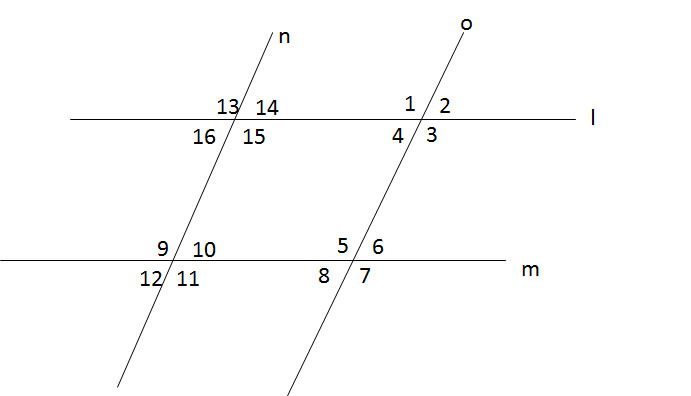 Angles 10 and 14 are equal, because corresponding angles are equal. Angles 14 and 13 are supplementary because together they form a straight line. If angles 10 and 14 are equal, then angles 10 and 13 must be supplementary as well. If A = 135o, what is 2*|B-C| = ? Two angles are supplementary and have a ratio of 1:4. What is the size of the smaller angle?